Former study abroad participants and travelers to Florence need look no further than Macy’s at Herald Square to rekindle their love of gelato at the first outpost of Vivoli, Il Gelato outside of Florence. When I first heard last month that Vivoli was opening in New York, I could instantly recall the first time I stopped by the famed shop on a small street in Central Florence – and how quickly I wanted to taste that rich gelato again. Vivoli is attached to the newest restaurant from the Patina Group, Stella 34 Trattoria. This grand space on the sixth floor of the East side of the building feels a world away from the hustle and bustle of its department store host. An un-crowded space, high ceilings, large windows with views on the Empire State Building and ample bar dining don’t take away from the key feature of Stella 34, the wood burning ovens open to the dining room. A number of well executed piccoli piatti, are on the menu to start. I tried a light and fresh calamari, well-balanced meatballs, and a perfectly sauteed bitter escarole. There is also an excellent selection of cured meats. Other distractions from the main event are on the menu including pastas from the stove and oven, as well as fish and meat dishes. However, you didn’t walk through the avenue long bedding department for those morsels, you came for the wood oven fired pizza made with flour and tomatoes imported from Italy and water specially formulated to match the pH and mineral balance in Naples – at least I did. Five classic pizzas and five bianca (no sauce) are featured. The benchmark for a well executed pizza can always be measured by the classic margherita, and this one stands up. Crisp, light crust, with a touch of sauce and fresh fior di latte mozarella and basil is enough of a reason to come to Stella 34. Other highlights are the barese, with bitter brocolli rabe and sweet sausage and the quattro stagioni, with ham, eggplant, artichokes and mushrooms – a different taste in every bite. On one occasion, a companion had the patate, a white pizza that features potato and pancetta. We were both a bit skeptical at first but it was a unique and excellent pie that I would order again. The servers were gracious and attentive and over the course of the last month have worked out a few kinks common to any young venture. One small irk was on my first visit: the strong encouragement to order gelato from Vivoli at the table. While fine and keeping crowding down from the attached counters at the entrance, it really takes away from the experience. How can you choose between the flavors of nocciola, pera, stracciatella or my favorite, crema without eyeing them first? On my next outing, we made sure to pay for the excellent pizza and make our way to the counter for our gelato. 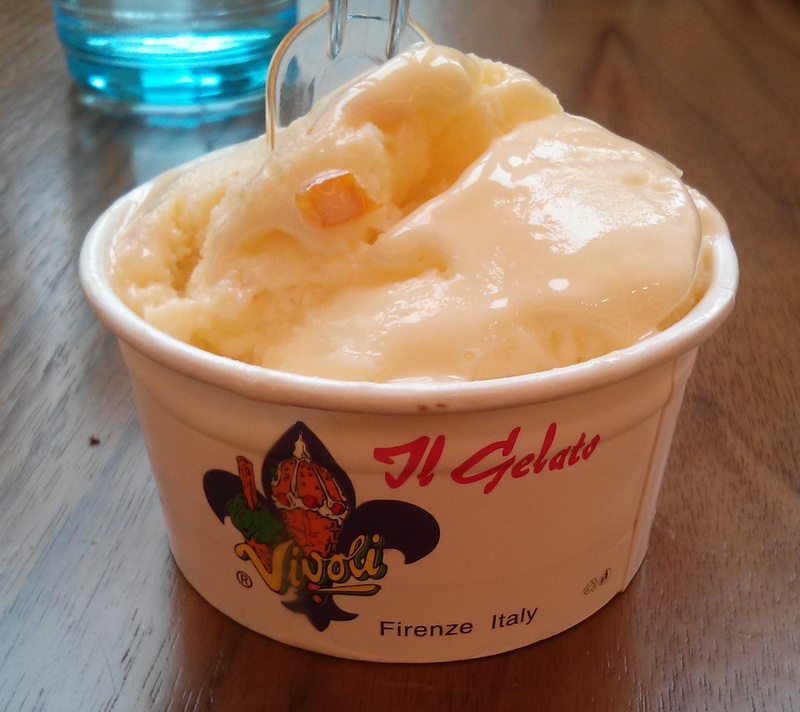 After choosing our flavors and getting the familiar Vivoli paper cup full of delicious gelato, we ate as we strolled. Unfortunately the walk was amongst 500 thread-count sheets and duvets before being able to descend the 5 levels of escalators. But it is good enough to transport you back to the side streets of Florence, even if for a moment, before being ejected to the cacophony of West 34th street.